A group of members of the French National Assembly have proposed a law to ban oxo-biodegradable plastics – not on the basis that they pose risks to health and the environment, but on the basis that they just might. This looks like a skilful lobbying attempt to take oxo-biodegradable plastics off the French market and leave the field clear for bio-based plastics which are not competitive with oxo-bio and have very limited usefulness. Lobbyists are trying to do the same in Italy and Spain. It would be surprising if the French Government allowed this proposal to pass into law, because in a civilised country you cannot close down a lawful business on the basis of a mere suspicion – you need to have credible evidence to justify such a serious interference with freedom. Moreover, any such law would contravene Art 18 of the EU Packaging Waste Directive, and even if that article were eventuallyamended as proposed by the Commission, it would still contravene Article 36 of TFEU (Treaty on the Functioning of the EU). Their main point seems to be that fragments of plastic might contaminate food and the environment. However, everything will fragment into the environment as it degrades, for example paper, textiles, conventional plastics, and bio-based plastics. Are they going to ban them all, even if they are not toxic? Oxo-biodegradable plastic does not therefore just fragment, but will be consumed by bacteria and fungi after oxidative cleavage has reduced the molecular structure to a level which permits living micro-organisms access to the carbon and hydrogen. It is thus “biodegradable.” This process continues until the material has biodegraded to nothing more than CO2, water, and humus, and it does so without leaving any fragments of plastic in the environment. In France, extensive work has been done over many years by Professor Jaques Lemaire at Blaise Pascal University. He is one of the world’s leading experts on oxo-biodegradability, and has no doubt about its efficacy, its safety, and its usefulness. He has been instrumental in creating the AFNOR Accord T51 808. The lobbyists are focussing the Deputies’ attention on the wrong standard. EN 13432 is a specification for biodegradation in the special conditions found in an industrial composting unit, not in the open environment. Oxo-biodegradable plastics are tested according to ASTMD6954; BS 8472; ISO 17556; UAE 5009, and the AFNOR Accord T51 808. These are not mere guidelines, but are detailed scientific tests which have to be performed to prove that an oxo-bio plastic is degradable, biodegradable, and non-toxic. There is no EN standard for oxo-biodegradable plastics because lobbyists have been using votes in CEN to block it for many years. However, the eco-toxicity tests in the standards for oxo-bio are the same as the tests prescribed for bio-based “compostable” plastics by EN13432. Oxo-biodegradable plastic does not contain heavy metals, and the salts contained within it are at such low concentrations that they are unlikely to be toxic to the environment. This is confirmed by the UK government. 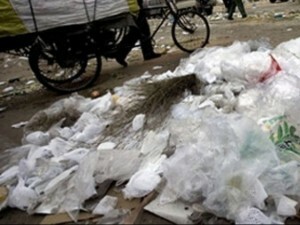 Bio-based plastics marketed as compostable cannot be made into compost. This is because EN13432 requires them to convert into CO2 gas within 180 days. This is not “recovery” but is conversion of the material into a gas, which contributes to climate change but does nothing for the soil. Bio-based plastics are useful as garbage sacks for transporting organic matter to a composting plant, but oxo-bio bags have also been trialled and found satisfactory for that purpose. European governments want plastic products to be recyclable, but bio-based bags cannot be recycled with ordinary plastics. Expensive separation processes would be necessary, but would not justify the cost, as they are dealing with a low-value and readily available material. Bio-based compostable plastic can be considered “renewable” only if you ignore the oil-based content of the material (which can be 40% or more) and if you ignore the extensive amount of energy used in making them. INTERNATIONAL USAGE:Oxo-biodegradable plastic is becoming popular on an international scale. The government of the UAE realised that they would never be able to prevent some of their plastic waste getting into the environment on land or sea, so they carefully considered the effectiveness and safety of oxo-biodegradable technology before making it mandatory to use it. The law covers not just carrier bags, but all disposable plastic goods and packaging. They rejected the bio-based alternative as it did not address the litter problem and had many other disadvantages.Nine other countries have followed their example – the largest being Pakistan. These have a combined population of 195 millions European factories and retailers cannot now export to those countries unless their disposable plastic products and packaging are made with oxo-biodegradable technology.